The Midwest Cover Crops Council (MCCC) strives to facilitate widespread adoption of cover crops throughout the Midwest, to improve ecological, economic, and social sustainability. The Cover Crop Decision Tool is an initiative by the MCCC to consolidate cover crop information by state to help farmers make cover crop selections at the county level. The tool makes seeding date recommendations based on county specific weather information, and sorts cover crop species by desirable attributes of the farmer’s choosing. Indiana was the first state in the Midwest to implement a decision tool for field crops and Michigan is currently the only state with a decision tool for vegetable crops. Indiana SARE (Sustainable Agriculture Research and Education) is funding the creation of a decision tool for vegetable crops in Indiana this fall. 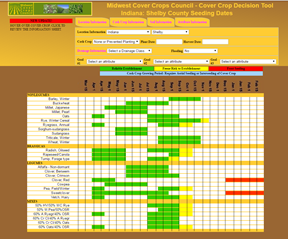 Both the IN field crops tool and MI vegetable tool can be found on the MCCC website (mccc.msu.edu). Figure 1 is an example of generated result by using this tool. Figure 1. A example of generated result by using this tool. We are seeking farmers who use cover crops in vegetable production to assist in crafting the Indiana Vegetable Decision Tool. We will have an in person discussion about seeding dates, seeding rates, and species attributes in central Indiana in November. If you are interested in participating in the construction of the IN Cover Crop Decision Tool for Vegetable Crops, please look for meeting details in the next issue of Vegetable Crops Hotline. If you can not participate the meeting in person, we would appreciate if you could send us your suggestions and expectations on the upcoming tool. If you have questions about this process or would like to know more, please contact Midwest Cover Crops Council Program Manager Anna Morrow at annamorrow@purdue.edu or 317-392-6417.